ASUS brings you the world's first discrete USB 3.1 card with a reversible Type-C socket for any-way-up connections. 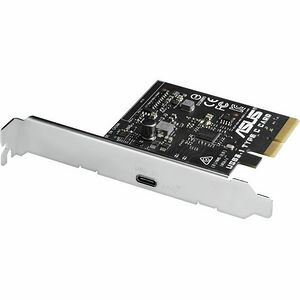 ASUS USB 3.1 Type-C Card (Single) is the simple-to-fit PCI Express expansion card that works with any PCIe x4, x8 and x16 slot. It adds the all-new reversible USB 3.1 Type-C port to your ASUS motherboard* for brilliant simplicity and ultimate-speed transfers of up to 10Gb/s - or twice as fast USB 3.0. The next-generation standard is completely backward-compatible with your existing gear, and you'll be all set for USB 3.1's breakneck speeds. And ASUS-exclusive USB 3.1 Boost technology pushes real-world speeds faster than ever before, sequential read/write speeds of up to 854.6/863.9MB/s.